God told Moses to send men to spy out the land of Canaan. He told him to send a man from each tribe. Twelve men were sent. They were to find out about the land and the people in the land. Moses said to find out if the people were strong or weak. Did they live in cities or in camps? He wanted to know what the fruit of the land was like, and if they had forests or not. 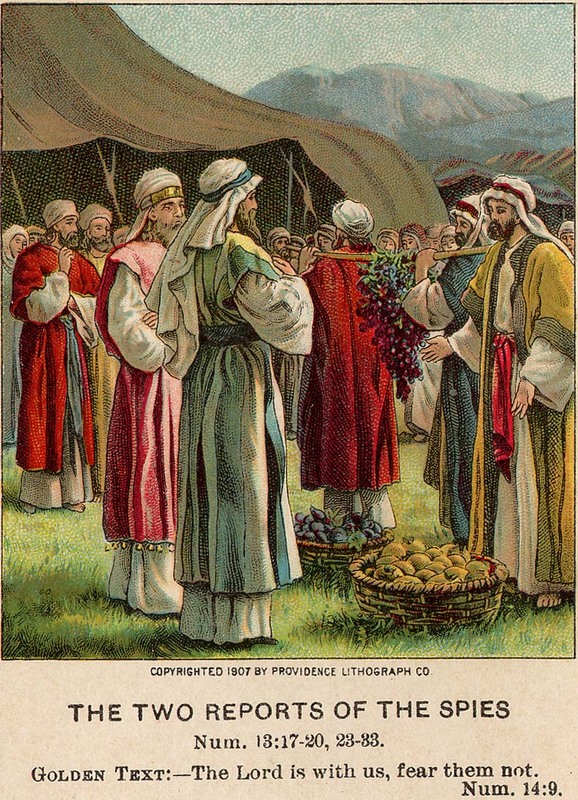 He asked them to bring back some of the fruit that was ripe. The men went into the land and found that it really was a good land. 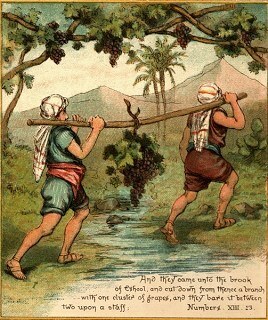 The grapes were so big that it took two men to carry a cluster of them on a pole between them. But the people there were very big and tall, and the spies were afraid of them. They were gone for 40 days. 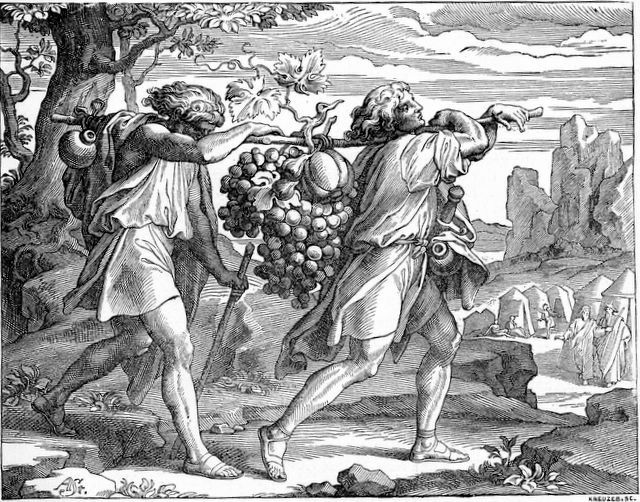 When they returned to their own camp, they showed Moses the good fruit they had found in the land. Ten of the men began to tell about the giants and how fearful they were. They told of large cities with high walls around them. "We cannot go into this land," they said. "We were just like grasshoppers in our own sight, and also in the sight of the people there." Two men; Caleb and Joshua said, "Let us go up at once and take possession, for we are able to overcome it." The Israelites didn't want to go and take Canaan as God had wanted. God punished them by making them wander in the desert for 40 years. They had to wander around one year for every day the spies had been gone. Of the twelve men, only Joshua and Caleb got to go into Canaan. We can learn two lessons from the story of the twelve spies. First, our actions influence other people. If we have a positive attitude, we are an encouragement to others for good. If we have a negative attitude, we discourage others. Secondly, God doesn't expect us to do everything on our own. Maybe you have started to a new school. Do you lack the courage to make new friends? Do you feel like you are a "grasshopper" in the sight of others? Take courage. God will help you. This story about the Twelve Spies can be found in the Bible in Numbers 13-14. Remember! This week's memory work will be saying all ten of the Ten Commandments. 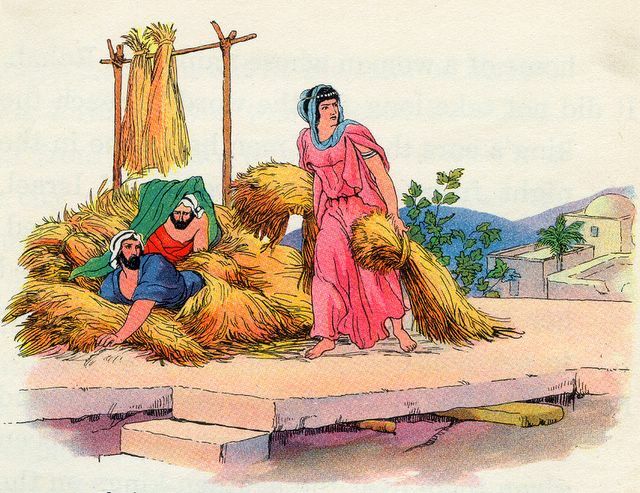 English Bible Activities Select story #49 in the list for activities to accompany this Bible story. Spanish Bible Activities Select story #49 in the list for activities to accompany this Bible story. Press "Go" to search for books about The Children of Israel. Thank you this was excellent. I am well satisfied with the material you have available. I would also be happy if you have available color pages. Thank you for all the resources, so many of them on this single lesson. This site has help my childrens church with learning the bible stories and made easy for children to understand I am nnow on my 4th year of youth director and I continue to use this site when I get a new group of kids because it is universal for all children! Thanks and God Bless! This page displayed 250,468 times.